You are here: Home / Crafts / A Sharpie Idea! I ran across this idea while I was baby sitting my Grandson this summer in Texas. I couldn’t wait to try it out, and I had some gifts to makes, so this seemed like the perfect time. It’s hard to believe I have missed so many Handmade Mondays, I have missed everyone, and I have missed making things. But I really enjoyed that little boy, and I miss him now that I am home and he is halfway across the country from me. I’ve been back a couple of weeks, but it’s so hard to get back into the swing of regular life. 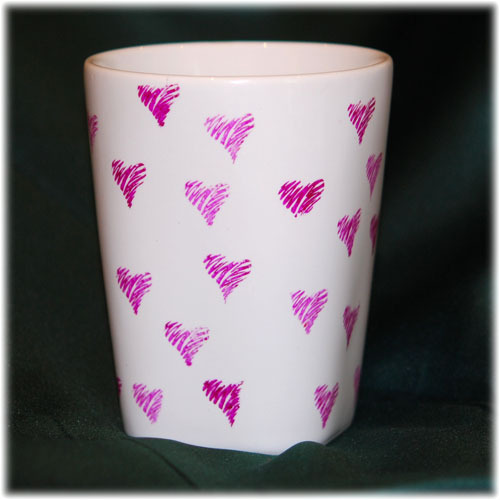 Anyway, I’m not going to rattle on and on, please check here to see the very easy to make Stamped Sharpie Mugs and then head over to check out Handmade Monday and see what everyone else is up to! I’m going to do the same. I hope they are all busy making things, and maybe talking about the Olympics, since most of them live right there! Glad you enjoyed your time with your grandson and hope you get to see him again soon. Like the Sharpie Mug – nice pattern. Hope you have a good week. Thanks. And I miss him already. I can hardly draw at all and so admire those who can. Love the mug and yes I can’t draw either so really appreciate the stamping ideas! This is really pretty. It is a really great effect. lovely idea. They are reall effective. Am loving the Olympics, See my post about the road race- and the rain! Thats really pretty. It’s always nice to spend time with family and little kids grow so quickly. I love the hearts on the mug, so pretty. Thanks so much for ‘hopping over the pond’ and visiting my blog. I’m really enjoying the Olympics, it’s great to have it here in the UK. It’s been great to watch, you all have done a very good job! great idea with using the sharpies on the mug. never thought of using sharpies on porcelain, let alone of baking the painting in the over, they usually recommend special porcelain pens for that. thanks for sharing! I only hope it really does last like they say. If not, I guess it’s not a big deal to redo them every so often.